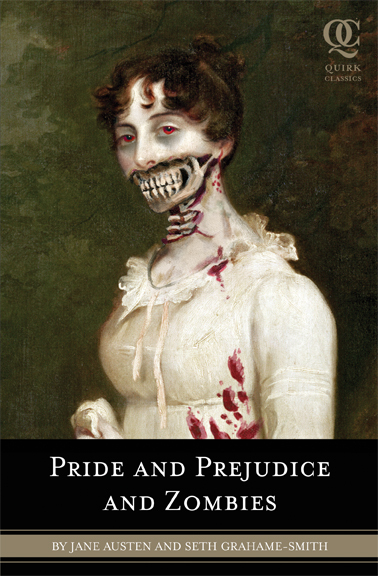 Pride and Prejudice and Zombies: The Classic Regency Romance – Now with Ultraviolent Zombie Mayhem! The original novel by Jane Austen is re-imagined within a world that is contending with a deadly plague that causes its victims to become undead zombies who hunger for the brains of the living. This is another instance of a book that I avoided reading for the longest time. I love all of Jane Austen’s books, so it’s difficult for me to want to experience them in any other light, especially one that is extremely far off from the story’s original intent. When I first saw this book I was amazed that an author would want to mess with one of the world’s most beloved authors of all time. I fully expected to find this another useless addition to the world’s library. But I have to admit, for the most part, I really enjoyed this novel. I thought it was so funny and still kept Jane Austen’s original tone in tact—remarkably so. One of the main conflicts in Austen’s works is women’s struggle to balance the necessity of marrying well with their sense of self and their innermost desires. In the Bennet household, marrying well was especially important because their estate is legally entailed to the next male heir, so their family would be without a home upon Mr. Bennet’s death. As we know, in Austen’s day, marrying well didn’t mean marrying for love, but marrying for prosperity. In Grahame-Smith’s version, this main conflict is still ever-present; however, not only do the girls have to marry a wealthy man, but also one who could protect them from the zombies that roam the land. Likewise, a gentleman might choose a woman who was “skilled in the deadly arts” over one who was an accomplished pianist, both of those qualities being equally important in choosing a wife. Many of the scenes in the original novel are the same in this book, but there is an added sense of wariness because the reader begins to expect zombies to attack at any moment. I thought it was interesting that I was still caught up in the original tension between Elizabeth and Darcy, while at the same time wondering if one of them would be killed and eaten. Now to the novel’s faults—there aren’t many! It was lively, witty, and engaging, and a tad bit frightening. I didn’t like that Elizabeth was so bloodthirsty—(at one point she bashes Darcy’s head into the mantel, and throughout the novel she slays hundreds of zombies and also many ninjas)—but I wonder if that’s what would have happened to the original Elizabeth had she lived in a country that was plagued by zombies. Obviously, you need a sense of humor in order to read this book. I also think it’s utterly imperative that you have read the original book by Jane Austen before reading this one because so much of the humor lies in the twists that Grahame-Smith gives to the original scenes. 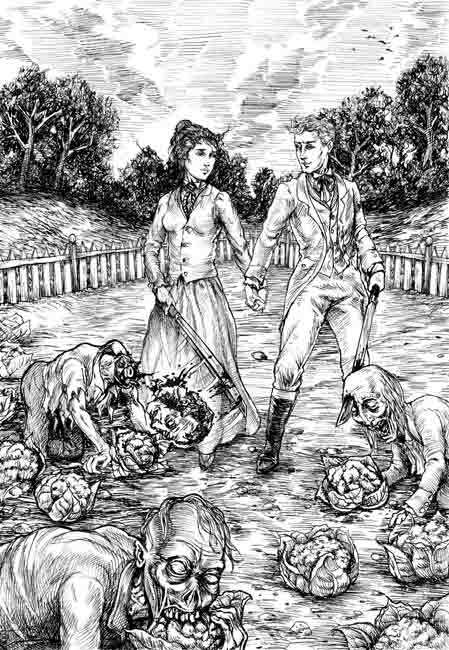 Illustration of Elizabeth and Mr. Darcy (also shown are zombies who have mistaken cauliflower for brains). This brand of information is dreadfully inadequate on internet. Pleasant to find the post related to my perceptive standard. Your rationalized and revealing post will be valued.